Consider the Pyramids … The start ! A pyramid is defined as a monumental structure with a square or triangular base and sloping sides that meet at a point at the top e.g. one built of stone as a royal tomb in ancient Egypt. 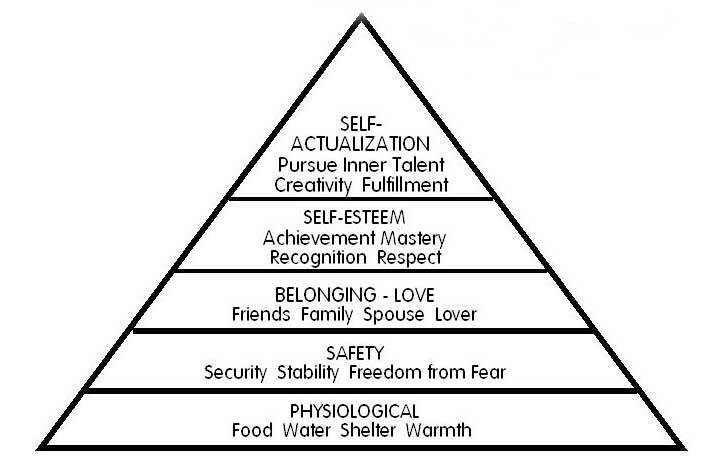 They built them with a wide base to ensure an even distribution of weight and a stable structure, so it is no wonder that Maslow chose the triangle/pyramid shape to illustrate the basis of his Hierarchy of Needs, with the base of it all being your basic PHYSIOLOGICAL needs. WHY/WHAT: What is your goal? Why are you doing this? Your first goal is that you want to make the change or develop your current regime further. Now think about what your ultimate goal is, make it achievable and remain focussed on it. In any fitness/exercise programme there will be down days but if you keep your ‘eyes on the prize’ it really does help. Whatever you decide to do, it is important that you make sure you are ‘medically able’ to cope with the kind of regime you want to do. WHERE: would you prefer a large/small Gym, an exercise class, working on your own or a one to one with a personal trainer? Do you want to go somewhere where no one will know you? WHEN: How often can you exercise and at what time of the day? This can be a vital part of your plan so think carefully about it. Think safety as well. WHO: Do you want to ‘go on your own’ or perhaps with a friend? Several people I spoke to like working out with someone as they feel it keeps them focussed. HOW: think about the kind of ‘regime’ you will need to do to achieve your goal, perhaps swimming is a better idea than they Gym, or power walking instead of running. These may seem very simple steps but each of them will influence your ‘basic needs’ that will in turn influence your ultimate goal. I asked a few people who are at various stages of ‘fitness’ what are the most important things they needed to keep ‘going’. Good sportswear: that ‘washes well’, that ‘looks good’, ‘that I feel comfortable in’ and in particular good ‘support’ wear. Ladies, go get measured for the sports bra, don’t guess! Diet and having it checked regularly. Tunes that work with the exercise or moves! But by far the most important thing was motivation, to most of the people I spoke to, if they did not have the motivation the ‘pyramid’ would crumble. So if your goal is to get into a pair of skinny jeans, lift a heavier weight, look good in a bikini or just delay that heart attack, fix your goal, get the basics right, make sure those needs are all ticked off and go get ‘em! Any questions you might have or advice, please leave your comment below or on Gin or Gym Facebook page! Previous Consider the Pyramids … starting the climb to a better view!